Telemedicine to diagnose eye diseases; a test to improve diagnosis of pharyngitis in primary care centers, and a solution to minimize children’s fear of needles: these are the topics of the projects that have come out of the fourth edition of Design Health Barcelona (d·HEALTH Barcelona), a groundbreaking program promoted by Biocat and inspired by the prestigious Stanford Biodesign fellowship to develop future leaders and entrepreneurs in healthcare innovation. The 2017 d·HEALTH Barcelona fellows presented their projects for the first time in public at the graduation ceremony of the fourth edition of this program, held on 9 November at the Mobile World Centre in Barcelona. These projects are the result of nine months of training, including a two-month immersion at Hospital Clínic, Institut Guttmann and Hospital Sant Joan de Déu Hospital Sant Joan de Déu to identify unmet clinical needs. 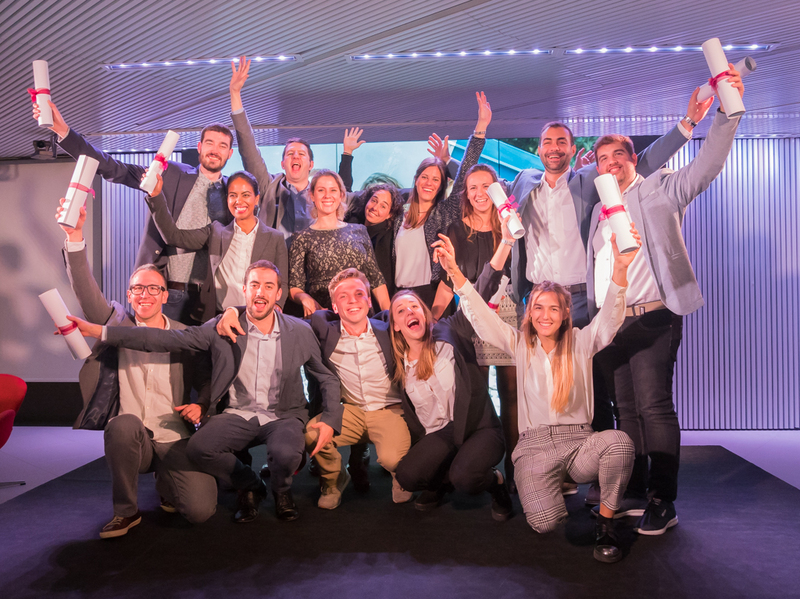 In total, this year the d·HEALTH Barcelona fellows identified 970 unmet clinical needs during their time at the hospitals, and they choose 3 to address with the innovative solutions presented at the graduation ceremony. The fellows got feedback from a panel of judges that featured Toby Reid, director de Biocity Nottingham; Joy Cürten, Business Creation Manager for EIT Health –a European consortium d·HEALTH Barcelona is a member of–; and Markus Wilhelms, CEO of Mowoot, one of the start-ups created in a previous edition of d·HEALTH Barcelona. During the event, Wilhelms explained the meteoric growth of his company, Mowoot, which was founded by fellows from the first edition of d·HEALTH Barcelona. He also discussed the lessons the team has learned after finishing the program. The company markets a wearable device to provide a non-pharmacological, non-invasive solution to chronic constipation without side effects. Rory O’Callaghan also shared his experience as co-founder of Tympany, a company that came out of the BioInnovate Ireland program. The d·HEALTH Barcelona fellows have had the chance to collaborate and do international exchanges with this and other similar programs through EIT Health. With a business survival rate of 91%, Biocity Nottingham, one of the largest accelerators for healthcare companies in the United Kingdom, is also a good place to turn for lessons. Toby Reid, director of Biocity Nottingham and keynote speaker at the graduation ceremony, shared the do's and dont's to improve startups' chances of success. Design Health Barcelona (d·HEALTH Barcelona) is a groundbreaking 39-week fellowship inspired by the prestigious Stanford Biodesign program that seeks to train and guide fellows through the biodesign process. Several business projects have already been launched by fellows from the first three editions and 97% of alumni have found work in the healthcare sector. During the program, multidisciplinary teams of four fellows with experience in the life sciences, engineering, business and design undergo a full innovation cycle –from identifying needs in hospitals to prototyping– guided by more than 70 international experts. Called “probably the most impressive accelerator/fellowship program we've seen emerge in Europe﻿﻿” by Health Startup Europe, d·HEALTH Barcelona works with Hospital Clínic, Hospital Sant Joan de Déu, Institut Guttmann and the Vall d'Hebron Barcelona Hospital Campus. The fifth course of the fellowship will begin in January 2018. Did you miss the conference by Toby Reid? Download his presentation with a summary of the highlights.